Show the world your creative and innovative ideas !! 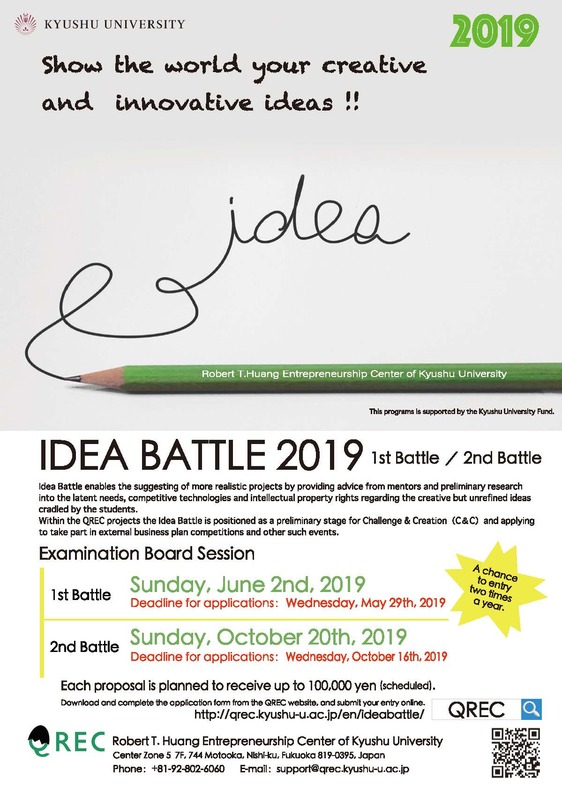 Idea Battle is a new project that was first set up in the 2014 academic year. It enables the suggesting of more realistic projects by providing advice from mentors and preliminary research into the latent needs, competitive technologies and intellectual property rights regarding the creative but unrefined ideas cradled by the students. When an idea is chosen for Idea Battle it is researched and investigated in detail for around three months, after which a highly accurate project plan is fleshed out and the team to execute the project assembled. Finally, a presentation of the project plan is given at the final presentation, and by sharing the plan with those assembled a chance is provided fir brushing up the idea and this serves as a preparatory exercise before the next stage of action is taken. Within the QREC projects the Idea Battle is positioned as a preliminary stage for Challenge & Creation（C＆C）and applying to take part in external business plan competitions and other such events. There were 15 applicants with eight projects selected. For the list of the 2nd Idea battle selected projects, click here. For the list of the 1st Idea battle selected projects, click here. ・The project must consist of members who are undergraduates or post graduate students at Kyushu University. ・The theme must be one that has been though up by the participants themselves. It does not necessarily have to be related to your major at the university. ・Individual applications are possible. However, you are encouraged to form a team by the end of the project. *Graduation theses, master’s theses and doctoral theses will not be eligible for screening. *Challenge and Creation (C&C). Academic Challenge (AC) and other granted projects will not be accepted. However, ideas that were suggested for these schemes but not adopted are welcome. The funds will be granted in line with the Kyushu University accounting regulations. It will not take the form of a one-off cash payment. There are two chances to apply for the 1st Battle and 2nd Battle each year. Download the application form and submit it ‘REGISTER NOW’. *Screening method: Please make an elevator pitch lasting one minute and not using a PC or other such equipment.